I first met Gene Wolfe in San Jose, CA in May of 2013. He had just received his well-deserved SFWA Grand Master Award in front of adoring peers and fans. Throughout the weekend, I watched as his autographing line never seemed to diminish, legions of readers eager to have their books signed by a master. Despite our brief meeting where I handed him a customary gift on behalf of SFWA, he was warm, soft-spoken, and genuinely appreciative of all the attention he had been given. I may be just a brief and smaller shadow in ever growing lines of people Mr. Wolfe has encountered throughout his life, but his writing has left such an indelible mark on so many in the science fiction and fantasy communities. So when given the opportunity to interview him at World Fantasy in Saratoga, I jumped at the chance. He was thoughtful and took me on many different trips down memory lane. I’m so grateful for the opportunity to speak with him. 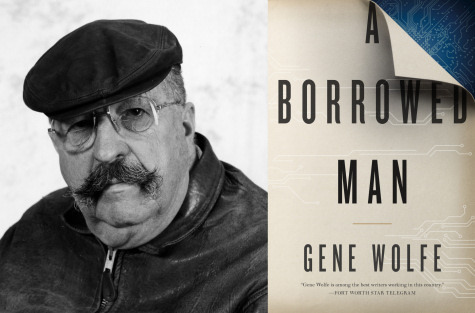 The author of over thirty works, Mr. Wolfe has been nominated and won multiple genre awards, has been inducted in the Science Fiction Hall of Fame, has been the guest of honor at many conventions, and his newest novel, A Borrowed Man, is out in stores now. With a critically acclaimed and award-winning writing career spanning multiple decades, what brings you back to the keyboard time after time? Oh my, it’s what I do. Why does the woodpecker peck the galvanized downspout? That’s what he does, he’s a woodpecker [laugh] and I’m a writer. I started by dictating stories to my mother as a very small child and I couldn’t write at that time, I hadn’t learned any of that. I had learned to read in a very simple way and I made up stories myself. My mother who knew shorthand took them down and later wrote them out for me. Is it the thrill of telling a great story? Yes! Being in the story, the other characters can’t see me, but I’m there. I think, gee, does the storm sink the ship or not and so on. Do you put yourself in a lot of your protagonists? No, I don’t think so, I’m too dull to be a protagonist. Protagonists usually have to do more swashbuckling than I have ever done. I do have a cutlass though. You do? Have you ever gotten to use it? No. [laugh] But I look at it and say, wouldn’t that be fun?! I like to have those things. My publisher gave me the cutlass when I was writing Pirate Freedom and it gives me the feel of what the weapon was like. This stuff gives you a little peek into the past or whatever it is that you don’t get from books. In the novel Peace, there have been quite a few interpretations of what actually happens to the protagonist, Alden Dennis Weer. While you’ve made the intentions clear in subsequent interviews, does it ever surprise you when possible unintended theories are mentioned? No . . . well. I’ve been doing this too long to be surprised because I’ve gotten some of the most off-the-wall, incredible interpretations and you look at some of this stuff and it’s just . . . crazy, and you think, well, anything is possible. Somebody can look into the story and what they are seeing is themselves. Did those fantastic interpretations ever give you any new ideas to write? Oh, no . . . not good ones. Not good ones. Empathy in the different shoes of a first person perspective takes practice. Is it the easiest method in which to write or the most meaningful? When you write third person, you remove yourself. It’s the distance, it’s something I’m seeing on a screen or something. When you have a first person narrator, you are much more into the story. Also, the first person narrator can comment from his viewpoint on actions. If the author comments from his viewpoint, it’s usually ruinously bad. Going back to that first person narrative, you have mentioned that even real people in general are unreliable narrators in their own lives, despite their best intentions. Why is that? Narrators are always unreliable. There are narrators that are openly unreliable and there are narrators that pretend to be totally reliable. But they are always unreliable because people are writing books and people can’t be trusted, you know? I read that a fan asked you once why there was a dearth of villains in your writing, to which you replied that good people are far more interesting than evil ones. Are you specifically speaking to the choices in light of tough circumstances or overcoming faults? I think it’s the human condition. If they are fictional villains, they have very narrow viewpoints. ‘What benefits me?’ ‘How can I make money out of this?’ Or there is just joy in cruelty, which of course exists, but it’s a very narrow thing. The thing you have to remember is that a real villain never thinks he’s a villain. You’ve mentioned in the past your love for H.G. Wells’, The Island of Dr. Moreau. Just how many times would you say you’ve read that book? To the best of my knowledge, four times. I read it three times in my early teens somewhere and then I started a fourth reading and I realized I knew everything and I said that I’m going to put that aside until I’ve forgotten it a little bit and then I’ll pull it out again. They put the whole novel in an issue of Famous Fantastic Mysteries and I didn’t actually look at it again until I had to write a piece for a man who was putting together a collection of essays. Now in your newest novel, A Borrowed Man—E.A. Smithe is a mystery writer brought back without consent as a “reclone.” One of the interesting aspects, and I hope not too spoilerific, is that despite being owned and unable to rebel from their current predicament, reclones are unable to produce any new works. They are not allowed to. That would cloud the issue, you see. But we’ve seen from multiple examples, record companies, publishers, etc., bring back “never before seen works!” of artists, authors, and musicians to make more money. Why bring back someone famous that you can’t use in that way or exploit? They would be consumed with their new work instead of talking about their old work and it’s talking about their old work that is what they’ve been brought back to do. You could clone Charles Dickens presumably, dig him up and get some DNA material and get yourself a new Charles Dickens. But, you want him to be there as a reference to the guy who wrote Oliver Twist and A Christmas Carol. E.A. Smithe is reborn into a world where every problem seems to be solved. No war, hunger, strife, etc. Yet, as we read on, we realize there are so many things left unsaid about underlying issues. Was there any particular parallel you wished to draw between your 22nd century setting and today? They definitely have their own problems. That’s just reality. Throughout human history, there are always underlying problems. Sometimes we don’t realize what they are. The caveman had underlying problems. I also noticed in A Borrowed Man, the publishing landscape has whittled down to POD only with a large absence of precious hand-held paper books. Is this inevitability, and if so, why? Yes. I grieve for that. That is part of what makes the civilization presented in that book a dystopia. If we abandon literature, we abandon the best part of the human past. I see that a sequel is in the works. Interlibrary Loan will follow in the footsteps of your mystery writer protagonist. Can you give us some advanced spoilers? No, because I haven’t finished it yet, and it may not be published, etc. etc. but . . . Smithe is sent to a different library on interlibrary loan and gets mixed up with a cookbook author and so on and so forth. Do you think you will ever return to the shorter forms, like The Fifth Head of Cerberus? Yes. Definitely. One of the things I’ve been promising myself as I try to write this new book is that I’m not going to start a new book after this, I’m going to write a bunch of short stories. Short stories are how you really learn how to do it. I used to believe that [writing short stories] wasn’t necessary, and in the strict sense, it isn’t necessary, but there are people who taught themselves to write by writing novels. But that’s doing something that’s already hard with one hand tied behind your back. You are making it that much harder on yourself and the readier path to writing good work and more publishable work is to write short stories. That’s why it’s so much to our advantage to have short story markets. There’s little left to urge someone to write a short story if it can’t be bought and published! Print markets are dwindling, but there are Internet paying markets and one would hope that there are more of them. Aside from writing short stories and learning the craft, what other piece of advice would you give a new writer? The main piece of advice that I would give to the new writer is to write. The difference between writers and would-be writers is that would-be writers write very little and writers write a hell of a lot and you learn by doing. You can read three books on swimming, and attend seventeen lectures on swimming but if you’ve never been in the water . . . you don’t know much about swimming. I have a time machine in my pocket. You can go back to one moment in your life to relive. What is it? Do I get to stay there? Oh wow, okay. I would go back to the moment where I went out of my bedroom on Christmas morning and saw a shiny new bicycle standing beside the Christmas tree. My parents were still alive. I was a kid, and I had life before me. There are things that I would change, but there are an awful lot of things I would just greet with joy. The family dog died when I was at college, when I got that new bicycle, she was still alive and so on and so forth. All this reminiscing about life and career, did you ever imagine you’d be doing this? Do you believe in fate? Yes. The completely materialistic view is clearly wrong. The world is full of things you cannot explain, one or two you can pass off as there will be some explanation later when we know more, but when you see how much there is that purely materialistic view cannot explain, you realize that view is only one part of a larger whole. Many people are trying to pretend that view is all there is. I was able to sit and have coffee one morning with Gene and his wife at Madcon back in 2010. He told me about his first experience reading The Island of Dr. Moreau. He said he read it once, and then went back to the first page and read it immediately over again. It's cool to see how much he brings it up in interviews and conversations. It seems to really have inspired him. Kate Baker is the Podcast Director and Non-fiction Editor for Clarkesworld Magazine. She has been very privileged to narrate over three hundred short stories/poems by some of the biggest names in Science Fiction and Fantasy. Kate lives in Northern Connecticut with her first fans; her three wonderful children. She is currently employed as the Director of Operations for the Science Fiction and Fantasy Writers of America.